I love making things. I love telling stories with pictures and words. I love the satisfaction I get from making something beautiful from the raw materials around me. This I created to satisfy this want for telling stories with words, pictures and/or videos. My zeal for adventure has led me to many places and will certainly lead me to discover new things and places. So come, explore new adventures with me through my stories. Looks like you have a fabulous blog here. 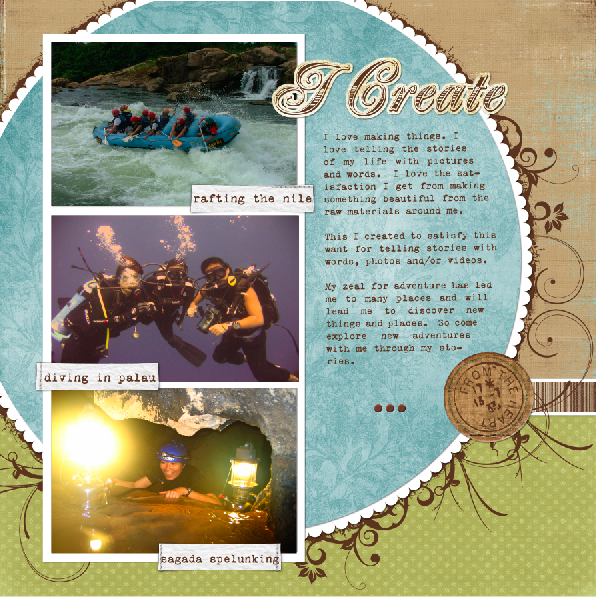 And, what a talent for photography and digital scrapbooking. That’s on my ‘to do’ list. Thanks for stopping by Greensboro Daily Photo. I like what you’re doing here. I think you have a really interesting story. I love traveling too! There are so many places I want to visit. Are you interested in guest blogging at all? I have lived in Yap, Palau, and St. Lucia. Perhaps I could write a post to add to your blog here, about “a day in the life of a resident” (in any of those places). Just a thought. Wow i really loved your blog. Very delightful to browse and the pictures are incredible, it’s very nice to see people’s accounts and retellings also to take charge and go out to do stuff. 😀 One of my favorites in WordPress. So amazing, you’ve been everywhere. love your blog..thanks for sharing! This is a beautiful blog. Lots of useful information, too! I have just launched s2kd.com, a travel site. The idea is for people to share the excitement of going places while offering useful information to other travelers. The site is also my humble attempt at supporting and promoting Philippine tourism. Nice photos and blog. I wish you many more adventures and travels to come. Life is a journey to be shared and never stopped until completed.